An 18-year-old’s first NHL training camp can be an intimidating experience. Moments of doubt may creep into a young player’s mind when he walks into the locker room for the first time, only to find it filled with veteran players he has grown up watching and idolizing. But Avalanche first-round pick Joey Hishon will be in a unique situation, as he’ll have a couple of familiar faces to look to for advice and guidance when he attends Colorado’s training camp in September. 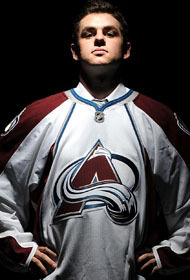 After all, he’s good friends with Matt Duchene and Ryan O’Reilly, a pair of players who were in his shoes just one year ago and went on to become regular members of Colorado’s lineup in 2009-10. Hishon even visited Denver this past season to watch a few Avalanche games and hang out with the pair. O’Reilly, for one, gave the Avalanche's first-round selection a firm thumbs up. But don’t think for a second that Hishon was drafted solely because of who he knows, as opposed to his impressive resume. While some may have labeled Hishon as an “off-the-board pick,” Avalanche director of amateur scouting Rick Pracey said that the forward was very high on Colorado’s draft list. Part of the reason Hishon fell in the rankings was likely due to a lack of exposure this season. The center suffered a pair of injuries which caused him to miss significant time, first breaking his foot while blocking a shot and later spraining his MCL. Playing in only 36 games for the Ontario Hockey League’s Owen Sound Attack, he still managed to put up 40 points (16g/24a) for a team-best 1.11 points-per-game average. Perhaps a better way to judge his potential would be to look at his stellar 2008-09 campaign with Owen Sound, during which he led the Attack in goals (37), assists (44) and points (81). He also received some recognition from the league’s bench bosses, as he was voted the “Best Playmaker” and “Best Stickhandler” in the OHL’s Western Conference Coaches Poll. And the players he beat out for those awards were no slouches either. In the “Best Playmaker” category, Hishon (31) more than doubled the votes received by both O’Reilly (13) and John Tavares (13), who ended up being the No. 1 overall selection at the 2009 NHL Entry Draft. To earn “Best Stickhandler” recognition, Hishon had to beat out the No. 7 overall pick in 2009, Toronto Maple Leafs’ prospect Nazem Kadri. Add in the fact that he was Team Canada’s leading scorer at the 2009 IIHF World Under-18 Championship and there’s little doubt that Hishon is a big-game player. But on this day, it was all about the joy of hearing his name called by an NHL team, fulfilling a dream held by every young hockey player in the world.